A former government assassin battles to survive in an apocalyptic world ravaged by war and infested with giant bugs in Apocalypse Nyx. Kameron Hurley has crafted a memorable anti-hero and set her loose to wreak havoc in a nightmarish world. Nyxnissa so Dasheem, Nyx for short, is a bounty hunter who prefers to solve problems with her fists or her scattergun, although she admits to being a lousy shot. Cast out from the bel dames, a guild of assassins, Nyx now spends her time drinking, swearing, hooking up, and frequently fighting to survive. She is hard and rugged, struggling to deal with past traumas, and shaped by the cruel world Hurley has created. Nyx is backed by a motley crew: magician Rhys, techie Taite, sniper Anneke, and shapeshifter Khos. Nyx is generally indifferent to the fate of her crew. If one goes down, she keeps going. The mission is what matters. Despite her coolness to her supporting cast, they remain loyal to her, even returning to her side after being left for dead. This suggests the characters can see something in Nyx lurking beneath the surface that the reader doesn’t quite get. Or, possibly, Nyx represents their best chance to survive in an unforgiving environment. The one notable exception is Rhys, for whom Nyx seems to have something resembling feelings, or at least interest beyond a quick tumble. Apocalypse Nyx is a collection of five novellas that take place in the universe of Hurley’s Bel Dame Apocrypha series. The stories read as a series of vignettes, something akin to a Netflix series based on a movie. The stories are well paced, with enough connections to lend a sense of cohesiveness to the collection. It’s not necessary to have read the companion trilogy in order to enjoy these stories. There are universe-specific terms to pick up on (trucks are bakkies, coffee is buni), and details about the world that must be learned inductively, but it doesn’t take long to become fully immersed in Nyx’s universe. The world Hurley has crafted is as fascinating and engrossing as it is horrifying, with elements of cyberpunk, and fantasy sprinkled atop a generous portion of science fiction. Nyx’s desert planet home bakes beneath the heat of twin suns is ravaged by centuries of Holy War, the cause long forgotten. Bugs are integrated into technology, including radios and trucks. Human bodies can be rebuilt, Frankenstein-style, or a person can be given a new body altogether. Hurley also incorporates elements of magic, including shapeshifting, lending the story a touch of the fantastic, but retaining the gritty, apocalyptic fantasy feel. Hurley does a solid job of reflecting many of our own current societal issues and tensions in her writing, including gender roles, sexual fluidity, and racial schisms. The culture is heavily influenced by Islam, and the never-ending cycle of war is sadly familiar. Hurley does not pontificate on any topic, unlike certain sci-fi classics, but instead paints a picture upon which the reader can reflect. 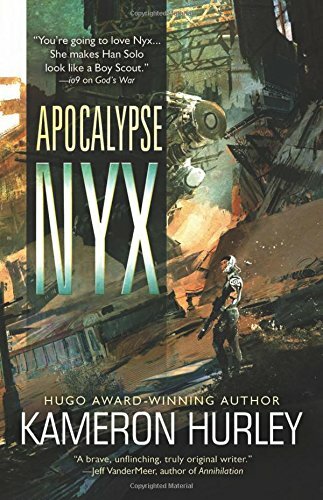 Apocalypse Nyx is grim, unapologetic science fiction at its best. Don’t miss this gripping collection!